7 Hammersmith Terrace is an internationally important Arts and Crafts "time warp" full of William Morris treasures. One of a terrace of Georgian houses overlooking the Thames at the west end of Hammersmith's Upper Mall, it was the home from 1903 to his death in 1933 of Emery Walker, the great printer and antiquary who helped his friend and neighbour William Morris to set up the Kelmscott Press. After Walker's death in 1933, his daughter preserved the house as it had been in her father's lifetime. Full of original William Morris wallpapers, textiles and furniture, it is the best-preserved Arts and Crafts interior in Britain. When Emery Walker moved in to the Terrace in 1879, the area around the river had become quite industrialised with oil mills and waterworks. 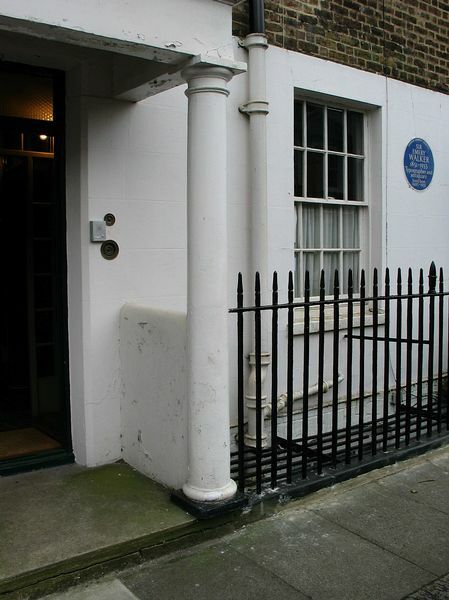 Walker and his family first lived at number 3 Hammersmith Terrace. In 1900, Walker set up the Doves Press with T.J. Cobden-Sanderson. The press, named after the nearby Dove pub, produced books until 1917. Along with decorative arts by Arts & Crafts makers the house contains objects collected by Emery, his daughter Dorothy, and her companion Elizabeth de Haas on their travels. Textiles from the Middle East are displayed with ceramics from Europe, Morocco and the Far East. There is furniture from Southern Africa and textiles and other objects from Central and Eastern Europe. No 7 Hammersmith Terrace was a private home until recently and it opened to the public for the first time only in 2005. Due to its fragile nature, the house can only take a few hundred visitors a year, so many people have yet to hear about it, let alone see it. Mayor of Hammersmith Minnie Scott Russell, after visiting in October 2007, said of the house, "I just think it feels like a very grown up doll's house and I could play for days in complete happiness". Admission to the house is by pre-booked guided tours between April and September. The tours last approximately one hour and take in the garden and rooms over three floors. The house can be reached most easily from Stamford Brook Tube station. Turn right out of the station, down to St Peter's Square and then through the Black Lion Lane underpass. Buses 27, 190, 267, 391, H91 to King Street; alight at Goldhawk Road. There are a few metered parking spaces in Hammersmith Terrace and more in St Peter's Square, off King Street, five minutes' walk from the house.